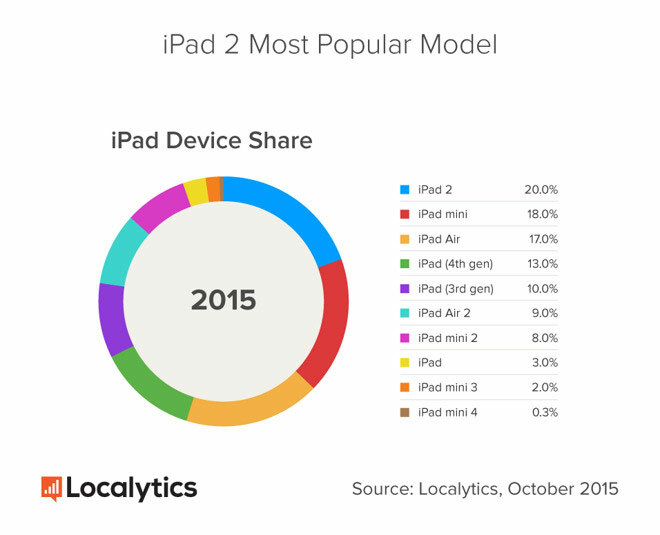 App analytics firm Localytics reports that in October just gone the semi-ancient iPad 2 (released March 11, 2011) and the original iPad Mini (released November 2, 2012) remain the most popular Apple tablets amongst users, with 20% and 18% of device share between them. Apple’s most recent models, the Air 2 and Mini 4, have just 9% and 0.3% market share respectively – despite the fact the Air 2 has had over a year on the market. Tablet sales have been in decline and Apple hopes the forthcoming iPad Pro will inject new life into what is clearly a stagnant marketplace. Those are exactly the two iPads I have, the 2 and the mini. They built the 2 so well that I honestly have had a hard time justifying replacing it. My wife is also still rocking her 2 and my daughters have the original 1.